The exhibition On Documentary Abstraction, now on view at the Oolite Arts (until 2 January), sounds, perhaps, like a contradiction in terms. But the New York-based art critic and independent curator Rachael Rakes has brought together four contemporary artists to show the sense of it. The exhibition features work by Torkwase Dyson, Tomashi Jackson, and the Canadian duo Richard Ibghy and Marilou Lemmens, who all practice forms of abstraction to address issues such as history, race and economics. While researching documentary film and social practice art from the 1990s and early 2000s, Rakes wondered: “What would a non-figurative documentary look like? How do you do that?” As she emphasises in a short essay published to complement the show: “Documentary has never been real, and has, from its beginning, been a form of art.” A truism by now, the fact nevertheless bears repeating, since it opens the door to the possibility for non-pictorial documentary art. 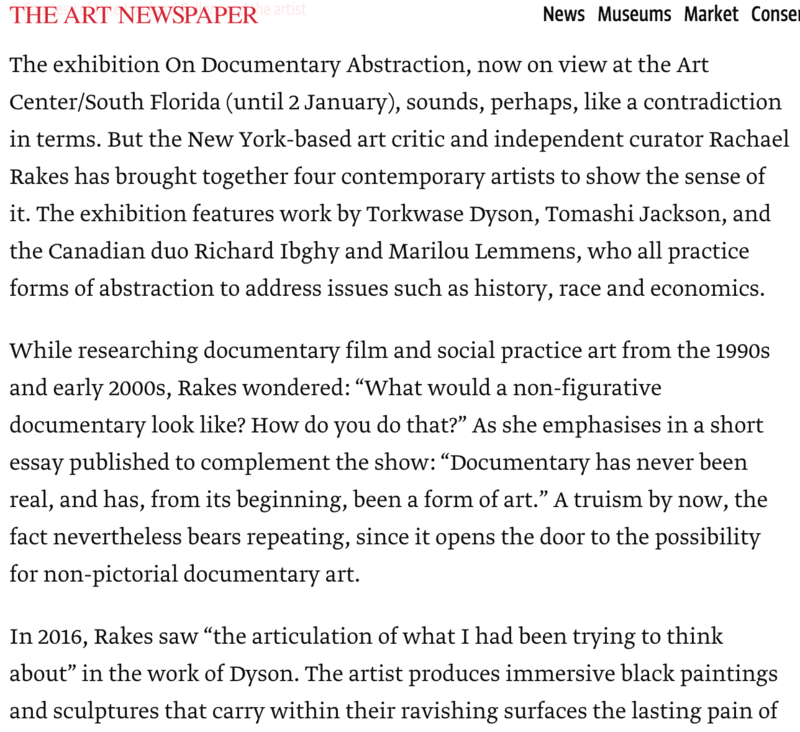 In 2016, Rakes saw “the articulation of what I had been trying to think about” in the work of Dyson. The artist produces immersive black paintings and sculptures that carry within their ravishing surfaces the lasting pain of slavery and racism. She is among a wave of artists today who thwart the sometimes counterproductive tendency to directly illustrate black suffering. “If you obstruct the information and communicate it differently, if you show it differently through spatial abstraction, it might have more of an impact,” Rakes says.